It is Whit Sunday morning or "Pentecost" as it is also called because it is the day that celebrates the time when the Holy Spirit descended on Jesus' disciples after he ascended to heaven on Ascension Day and they all started to speak in many different languages as the Spirit gave them utterance. 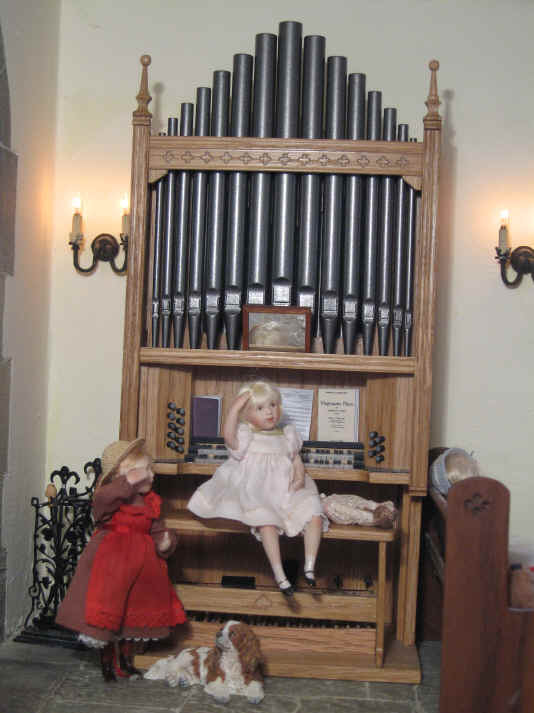 See how the children enjoyed a rather unusual Pentecost Sunday when the vicar sprang an unexpected but delightful surprise upon them. 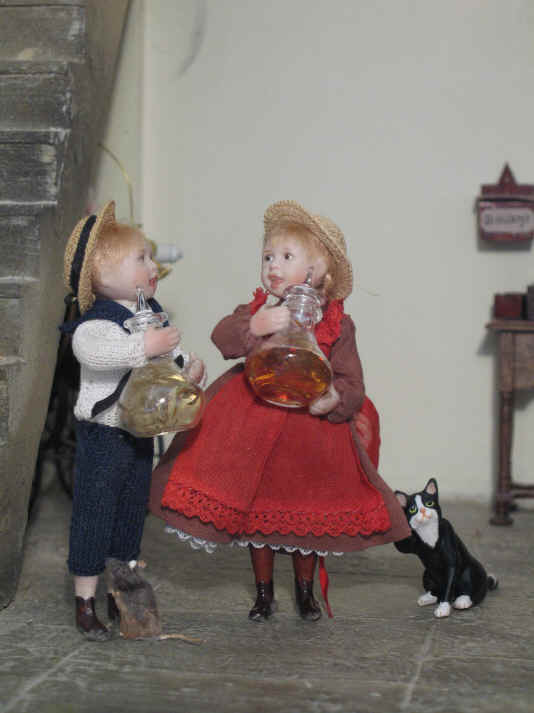 Tom and Adele have been asked to bring these pretty jars of oils to church by the vicar! They are both MOST curious because they have NO idea how oils are related in any way to the celebration of the coming of the Holy Spirit. Tinker is by Adele's side and wants to check this oil out too as does Sepp, the rat with Tom! 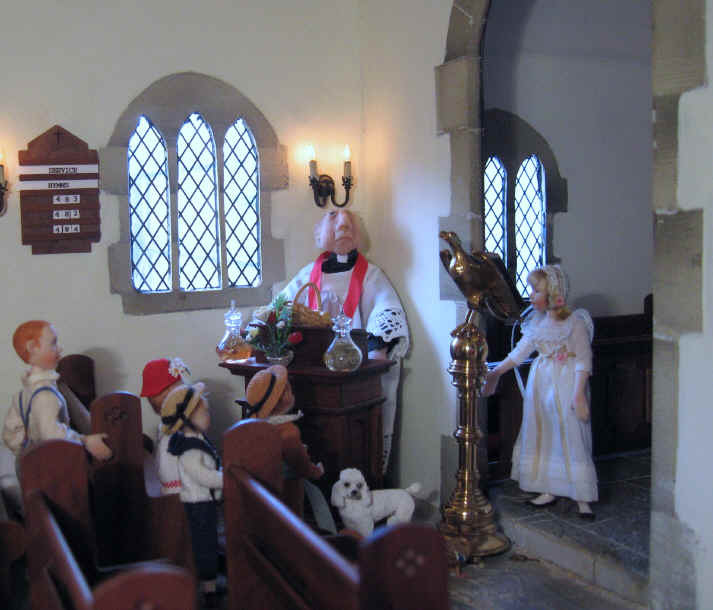 They ALL want to know what the vicar is going to talk about this Pentecost Sunday. 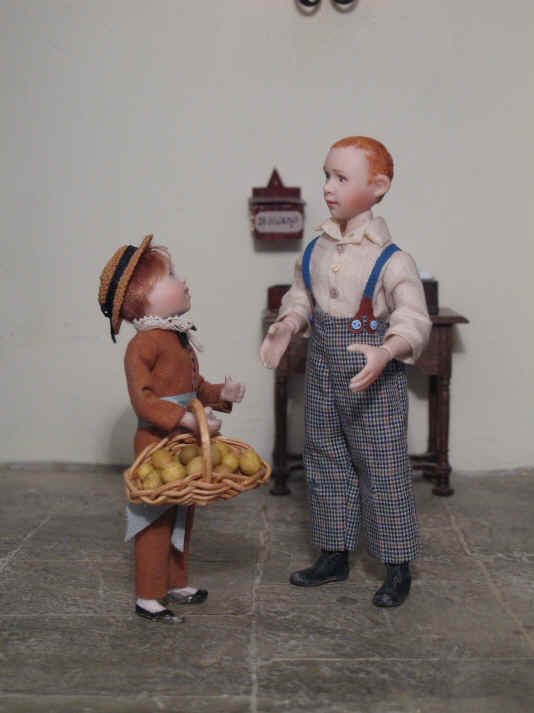 Curiouser and curiouser........WHY has Ambrose asked Tom to bring some of his home grown potatoes to church today? 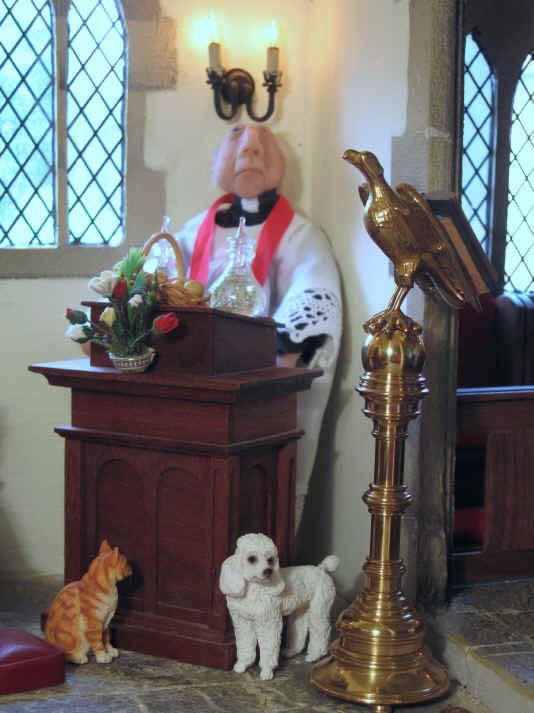 Even Ambrose has no idea why the vicar asked him to bring some today! 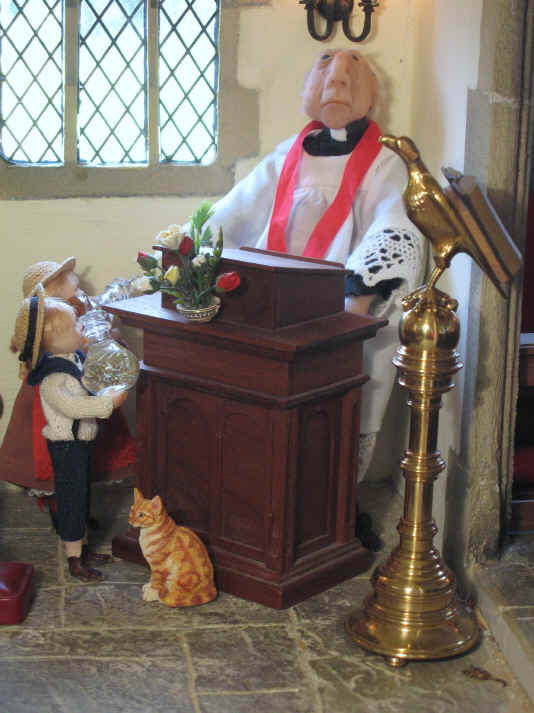 At last........the vicar has asked the children to bring the oil jars up to him after he went into the pulpit! Adele and Tom were most happy to be relieved of them as they were VERY heavy! 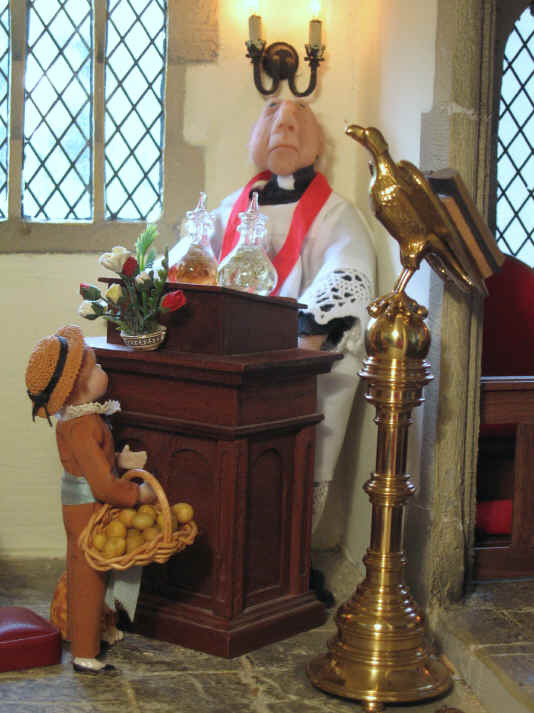 Ben brings his basket of potatoes up for the vicar now and the vicar is happy to receive them. The vicar settles the children down and explains that the Holy Spirit can be represented by many different symbols. He reminded them that they often see a dove or fire as representative of the Holy Spirit. He then explained that people have also thought of the Holy Spirit as oil too. Before the vicar explains why he asks them what they would normally think that oil would be used for today. Adele and Phoebe both put their hands up at the same time! Adele tells the vicar that she knows her father puts oil in their family car! The vicar congratulated her and said that yes, indeed, cars need oil or the engine would seize up and stop working! Phoebe then spoke up and suggested that oil can also be used for cooking! Phoebe LOVES chips and she only had chips the other night. Her mother makes their own chips out of potatoes and when Phoebe saw the basket of potatoes she remembered! The vicar was very pleased with Adele and Phoebe for remembering two very important uses for oil. The vicar then went on to explain why people think of the Holy Spirit as oil. He said that olive oil was used in the Old Testament times in order to anoint people who had a special job to do. David was anointed by Samuel, the prophet. David later on became the king of Israel. Oil symbolises God's blessing. So the Holy Spirit, by the same token, is God's blessing on all mankind. A blessing which was given to all at Pentecost who want to receive it. The vicar told the children that the anointing of the Holy Spirit on all people, including themselves, like the oil in a car, helps them do good work for God in their lives. Without Him they, like a car without oil, would seize up! The vicar then promised them a special treat! Pentecost is also the birthday for the church so the vicar has arranged for the children to have a birthday lunch of egg and chips! Ah..................so THAT is why Ambrose was asked to bring those potatoes..........all is revealed! Naturally the children are delighted. Who have we here..............? It is Megan and..................Esme too?!! 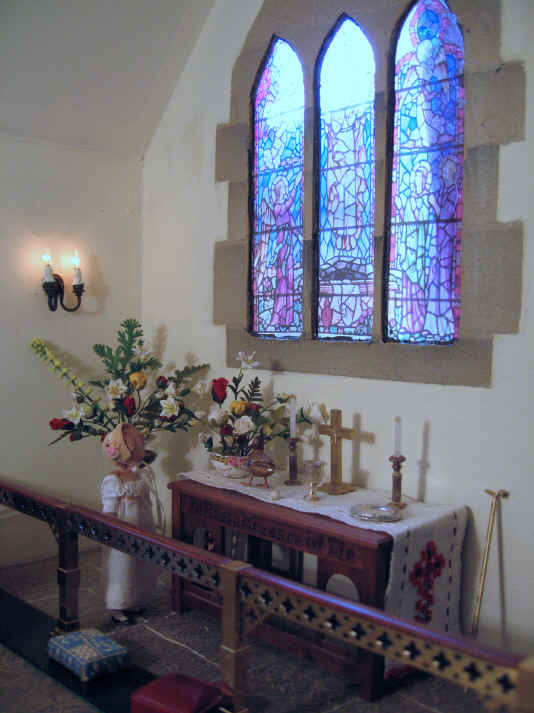 Megan always enjoys admiring the flowers in the church and especially the sanctuary and those on the altar too! Esme couldn't resisting flying up to the altar VERY carefully so as not to disturb anything on the altar of course, in order to take a closer look and to sniff the lovely scent of the flowers! 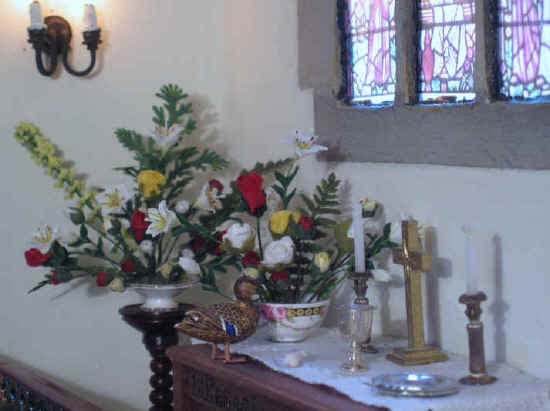 Oh dear..........Esme is STILL checking out those flowers on the altar! She just loves to sniff their lovely scents! We just wonder though.......will the distant smell of cooking chips move her?????!! Download a Pentecost lesson plan (by Miss Lorna Webb) and templates on our Pentecost lesson page.. Many thanks again to Lorna for preparing for us this lesson plan! Many thanks to Catherine Davies (my, Sarah's sister) for the two beautiful bottles of oil with vegetation and potatoes! They were, of course, made all by herself! Egg and chips are a personal favourite of ours! We were delighted that our hostess at our church home group Christmas social evening, fried egg and chips especially for us even as everyone else had more fancy and intricate fare. We are happy to report that our hostess did such an excellent job that others of our group have demanded an egg and chip Christmas social next time! So we see nothing wrong in celebrating special birthdays with egg and chippies for a change instead of the more usual and expected birthday cake!